Ships tomorrow if you order in the next 17 hours 13 minutes. 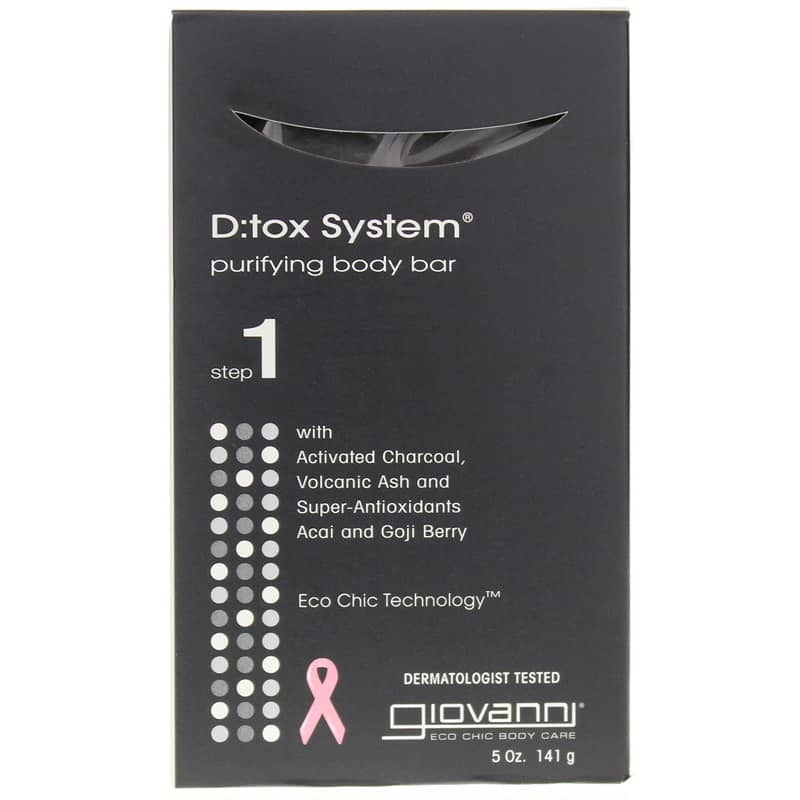 D:tox System Purifying Body Bar Step 1 from Giovanni Organic Body Care features activated charcoal, volcanic ash and super-antioxidants Acai and Goji Berry. Deep within skin, debris and toxins reside, clouding the skins natural radiance. 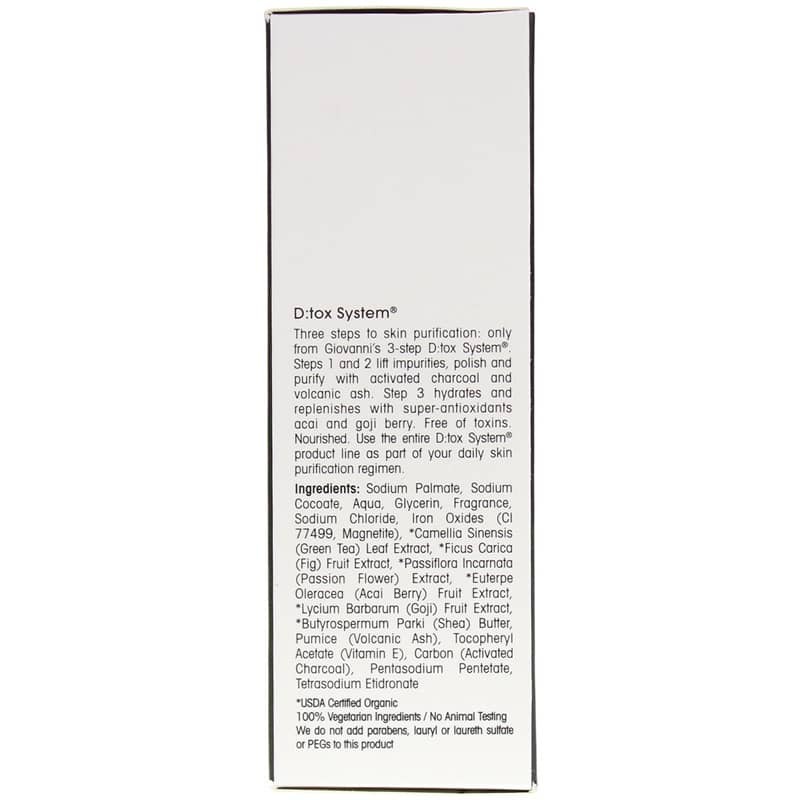 Triple milled D:tox System Purifying Body Bar uses super-cleansing activated charcoal and volcanic ash to lift pore-clogging toxins, oils and debris- readying them to be rinsed away. Hand-harvested, antioxidant-rich acai and goji berry infuse skin with the vitamins so critical to smooth, beautiful, purely touch-worthy skin. The result is skin with noticeable clarity, gently fragranced with essential oils of luscious fig and clean green tea. Steps 1 and 2 lift impurities, polish and purify with activated charcoal and volcanic ash. Step 3 hydrates and replenishes with super-antioxidants acai and goji berry. Sodium Palmate, Sodium Cocoate, Aqua, Glycerin, Fragrance, Sodium Chloride, Iron Oxides (Cl 77499, Magnetite), *Camellia Sinensis (Green Tea) Leaf Extract, *Ficus Carica (Fig) Fruit Extract, *Passiflora Incarnata (Passion Flower) Extract, *Euterpe Oleracea (Acai Berry) Fruit Extract, *Lycium Barbarum (Goji) Fruit Extract, *Butyrospermum Parkii (Shea) Butter, Pumice (Volcanic Ash), Tocopheryl Acetate (Vitamin E), Carbon (Activated Charcoal), Pentasodium Pentetate, Tetrasodium Etidronate. Step 1: Lather Purifying Body Bar in hands and work over body to create a rich lather. Rinse. Follow with Step 2 and Step 3 of the D:tox System to complete your skin purification regimen. Smells great, skin feels great! This soap.is excellecent and makes.your skin very soft feeling.